YALE (US) — Researchers have identified the most primitive known snake, and they say it descended from terrestrial rather than marine ancestors. “It’s the missing-link snake between snakes and lizards,” says Nicholas Longrich, a postdoctoral fellow in the geology and geophysics department at Yale University and the lead author of a paper published in the journal Nature. The paper argues that snakes emerged once lizards developed long, limbless bodies for burrowing. A relatively small creature with a serpentine body and a lizard-like head, the ancient protosnake—Coniophis precedens—represents an extremely rare transitional life form and sheds light on the divergence of snakes from the broader family of lizards. In contrast to modern snakes, this elongate creature’s jaws remain fixed, limiting the size of its prey, probably to other small reptiles and amphibians, the researchers say. Most living snakes have jaws that unhinge, allowing many species to eat mammals and other prey larger than themselves. This competitive advantage has contributed to exceptional diversification, and snakes today are the most diverse lizard group. For more than a century, scientists had described only a single isolated Coniophis vertebra, and hardly anything was known about its anatomy or lifestyle, much less its place in snake evolution. 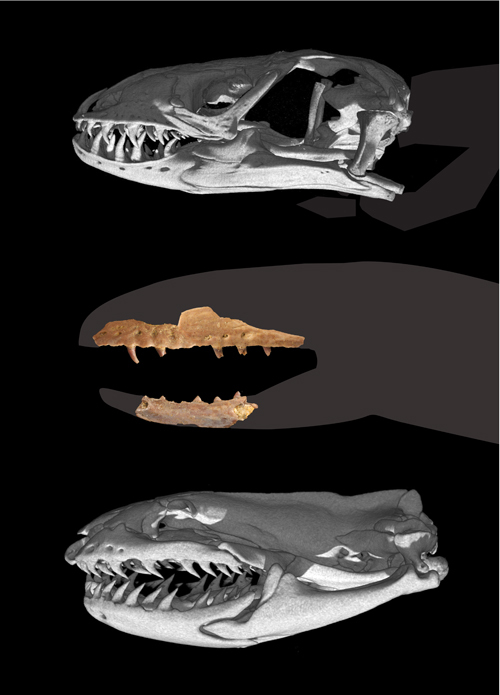 Longrich and colleagues established a more detailed picture after identifying additional tiny bones that had been collected but never studied. The additional bones—pieces of upper and lower jaw, teeth, and additional vertebrae—lay in existing museum collections around the country, including Yale’s Peabody Museum. Small and light, ancient snake bones are rare, and evidence of transitional forms more so. This has left snake origins poorly understood. All known Coniophis fossils come from floodplains in eastern Wyoming and Montana—from the same soil deposits as mammals and terrestrial lizards, including the dinosaurs T. rex and Triceratops—indicating that snakes evolved as terrestrial rather than as marine animals, Longrich says. The Yale Institute of Biospheric Studies and the National Science Foundation provided support for the research.